Thanksgiving #NFL favorites (last 9 years): Won 23 of 25 games (20-5 against the spread). Wow. Last 9 Thanksgiving games, #Lions have won ZERO and covered ZERO. Broncos-Chargers yesterday. Down 28-13 with 10:42 remaining in the fourth quarter, the Chargers score a touchdown, bringing the score to 28-19. NANTZ: Of course, it's too early to go for two, if you do the math on it. Everybody would know, you wouldn't want to leave yourself nine down if you failed, so you go ahead and get yourself in a one possession game by kicking the PAT. SIMMS: The book says go for two, but I think that shows you something. All books don't tell the truth. NANTZ: I'll tell you what, if that's what the book says, take the book and burn it. NANTZ: Seriously. I mean, who in the world would go for two with 10 minutes and 42 seconds to go in the game? SIMMS: To me, here's why you don't evn think of going for two. You want to continue the game, in other words you want to at least have the Denver offense and team think about, "Hey, they're only one score down, we have to keep pressuring [sic] the issue." 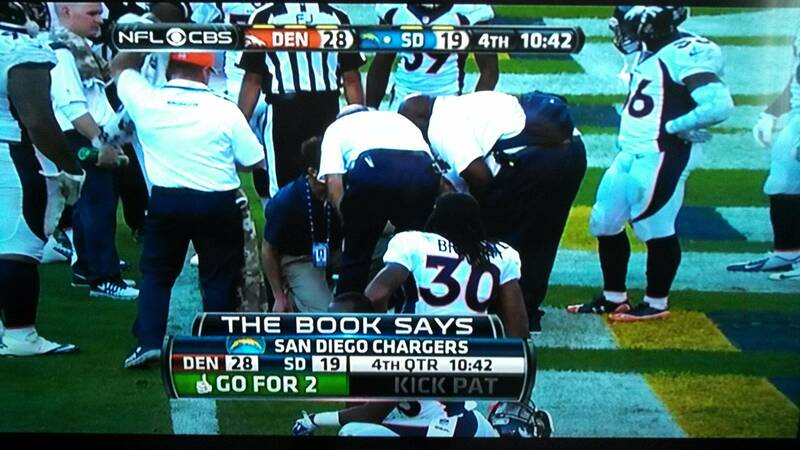 So if you went for two and did not get it, that takes a lot of pressure off of the Denver football team. So I would say, continue the game, and make the other team make plays. NANTZ: Let me just add, that's not exactly a New York Times best seller, that book. Because 32 out of 32 NFL coaches would be kicking the PAT right here, and that's what we're gonna have. SIMMS: Well, they just put that up there to get you riled up. So that was good, we love that. NANTZ: It's an eight-point game, it's a one possession game.